SHERWOOD — It was a big game. It was an important game. 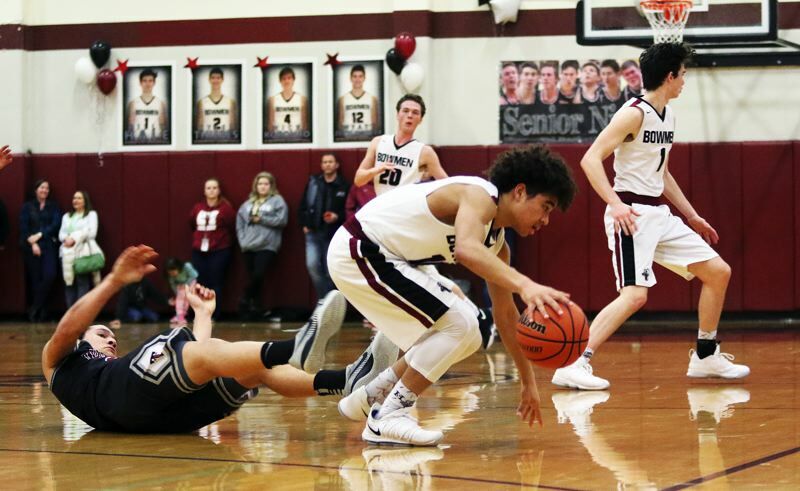 The Tualatin High School boys basketball team really, really wanted to win it. But, after four quarters of intense play, there was no winner. A four-minute overtime session also couldn't determine a victor. However, after a second overtime period, the Timberwolves got to celebrate a hard-fought victory. 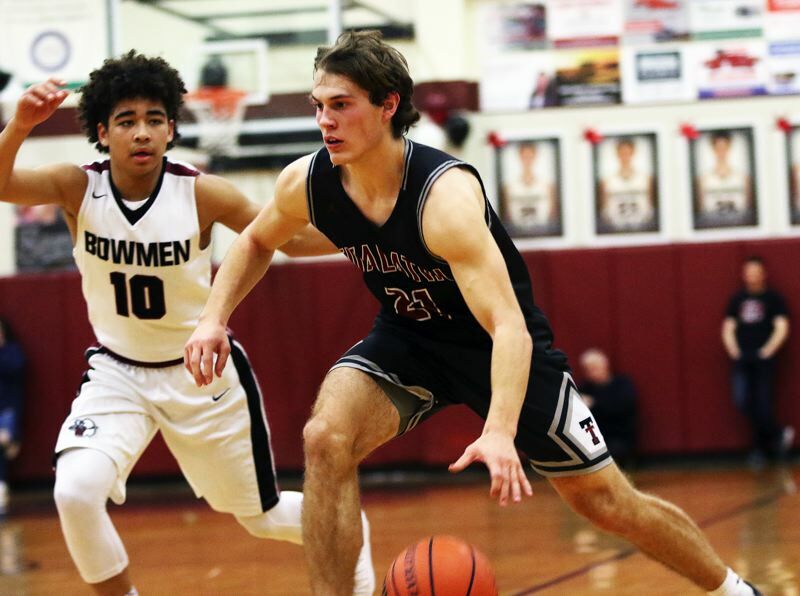 With fourth place in the league standings on the line, Tualatin emerged with a 63-58 double-overtime win in a Three Rivers League contest played Thursday at Sherwood High School. 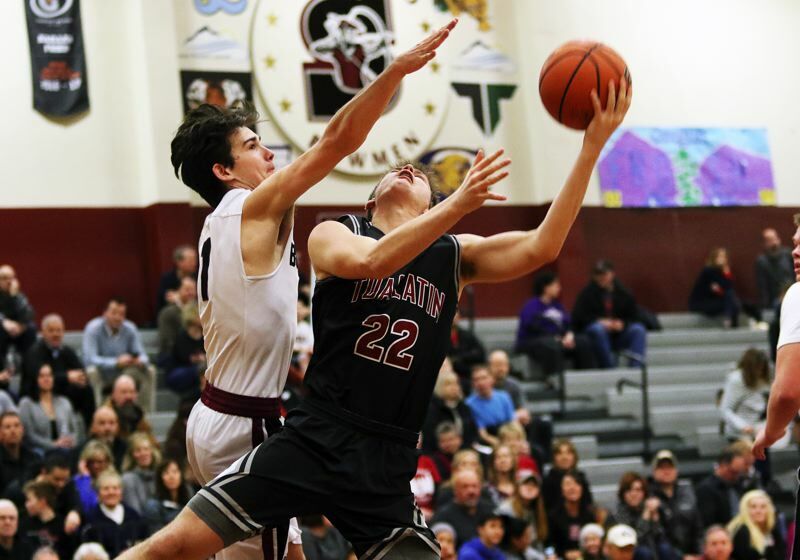 "That was crazy," said Tualatin senior wing Alexis Angeles, who scored a game-high 23 points. "We've had a lot of games in league that have come down to the wire. It just came down to getting defensive stops tonight." 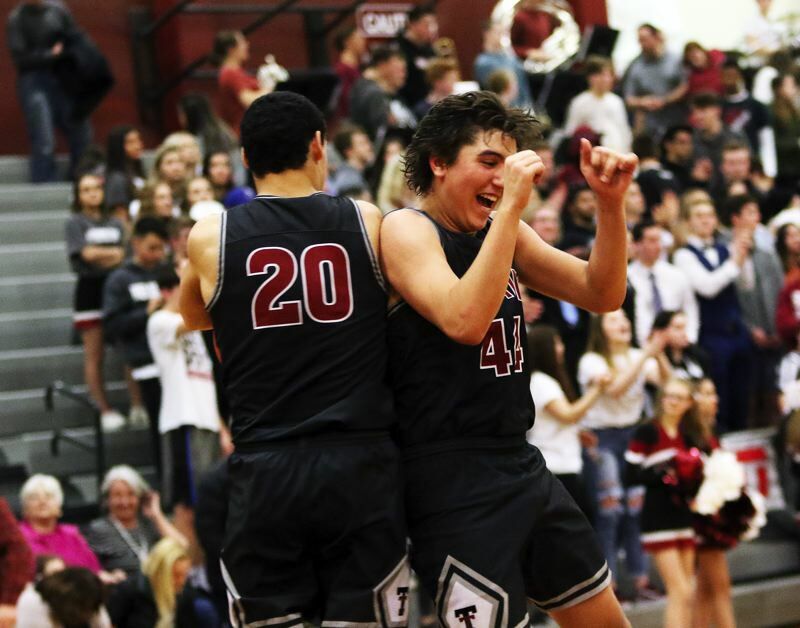 "We really needed this game, so we gave it our all," said Tualatin junior post Bridger Steppe, who went 4 for 4 from the free throw line in the decisive second overtime. "They're a really good team. They have a lot of good shooters, so we knew we had to step up." 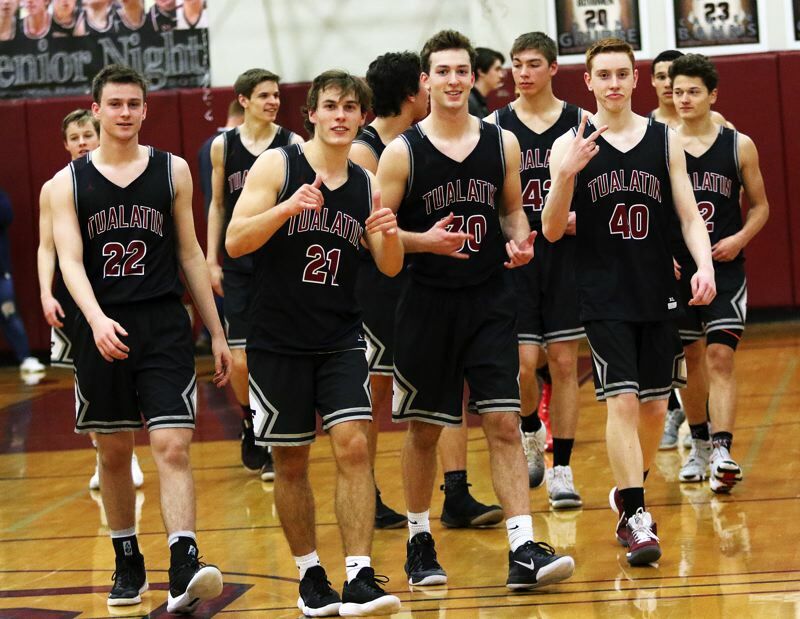 With the win, Tualatin improved to 8-6 in TRL play (16-8 overall), giving the Wolves fourth place in the final league standings, and the automatic Class 6A state playoff bid that goes with it. "We're ready for the playoffs," Steppe said. "Games like this will help us." 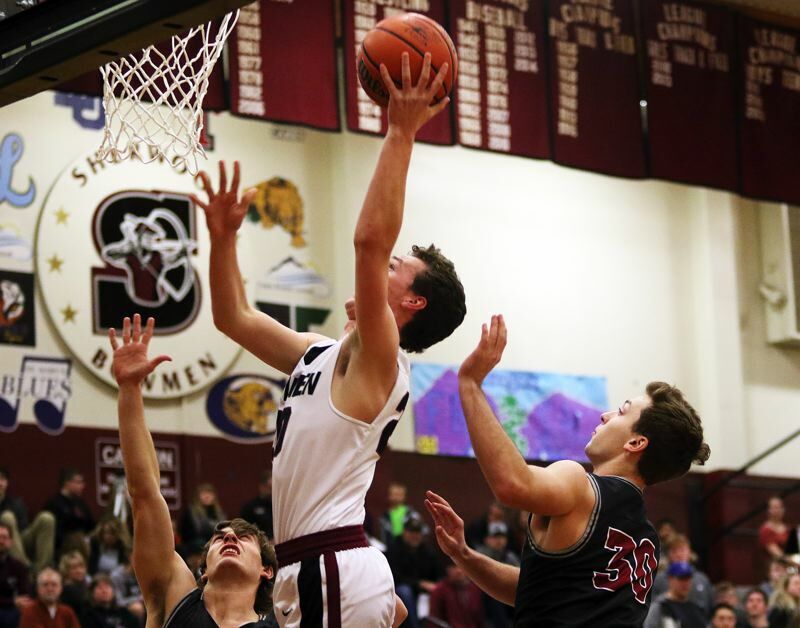 With the setback, Sherwood moved to 6-8 in TRL games (13-11 overall), leaving the Bowmen in fifth place in the standings. "We knew it was a big game," said Sherwood senior Billy Hale, who scored 13 points in the contest. "It didn't go the way we wanted it to, but we showed our competitive spirit." 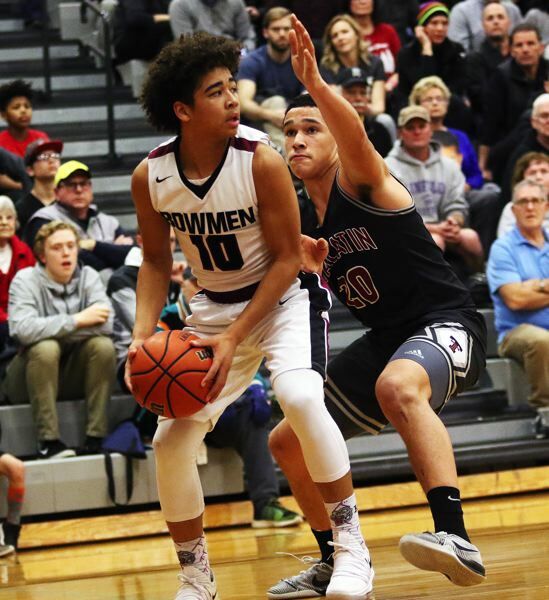 While the Bowmen missed out on one of the league's four automatic berths to the state playoffs, they did earn the final at-large playoff bid, meaning they'll be one of the field of 32 teams. "We'll be prepared for the playoffs," Hale said. "We feel like we can play with anyone." Sherwood got off to a fast start in Thursday's showdown. 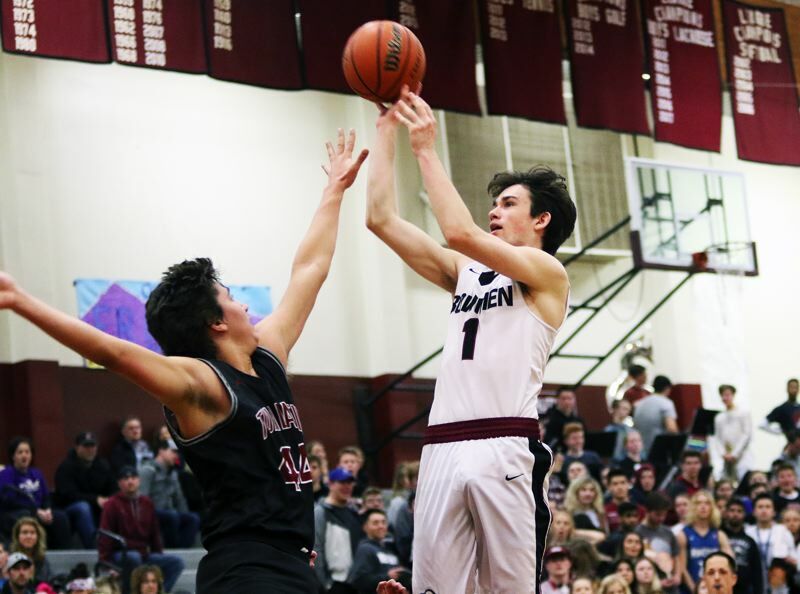 Bowmen senior Owen Grubbe scored four points in the first quarter, senior Nic Koronko added a 3-point basket and senior Carter Bahns drilled a buzzer-beating 3-pointer from the right corner, giving Sherwood a 13-5 lead at the end of the opening period. Tualatin came storming back in the second quarter. Junior guard Derek Leneve came off the bench to score six points in the period. Junior Caden Dickson and senior Nathan Platter each added a 3-pointer in the quarter, helping the Wolves rally to take a 22-21 halftime lead. Koronko heated up, in a big way, for Sherwood in the third quarter. He went 3 for 4 from 3-point range in the period. Bowmen senior post Jace Sucher added five points in the quarter, helping Sherwood bounce back to take a 37-34 lead at the end of the period. Bridger opened the fourth quarter by converting a three-point play, tying the game at 37-37 with 6 minutes and 24 seconds left in the contest. The intensity, on both sides, seemed to pick up from there. Tualatin took a 41-39 lead when Angeles sank a baseline jumper with 4:51 remaining. Sherwood tied it up when Hale came up with a steal and layup with 3:44 left to play. The, following a steal by Koronko, Hale drained a 3-pointer from the left side, giving the Bowmen a 44-41 lead with 3:12 remaining. Tualatin answered with a 3-point basket by junior Jack Rose, tying the game at 44-44 with 2:45 left to play. Sherwood, following a defensive rebound by Sucher with 1:40 left to play, held the ball, going for the final shot. Angeles foiled those plans, coming up with a steal with 7 seconds left to play, but his layup attempt was off the mark as time ran out, sending the contest to overtime. Angeles converted a three-point play to give the Wolves a 49-46 lead with 2:30 left in the first extra session. But Sherwood, getting a bank shot by sophomore guard Jamison Guerra and a 3-pointer by Koronko, rallied to take a 51-49 lead with 1:08 left to play in the first overtime. Tualatin came back to tie things right away, with sophomore John Miller scoring on a layup off an inbounds pass with 0:55 remaining. Again, Sherwood would go for the last shot, but a 3-point attempt in the final seconds was off the mark, sending the game to a second overtime session with the teams tied at 51-51. Hale opened the second OT with a follow-up basket, giving the Bowmen a 53-51 advantage. A free throw by Angeles trimmed the lead to 53-52 with 3:28 left to play. Following a defensive rebound by Miller, Steppe was fouled with 2:02 left to play. He went to the free-throw line in a one-and-one bonus situation, and he sank both free throws to give the Wolves a 54-53 lead — and they wouldn't trail again. Baskets by Angeles and Rose upped the lead to 58-53. Sherwood answered back with a 3-pointer by Hale, cutting the margin to 58-56 with 1:04 remaining. Steppe was then fouled, putting him on the foul line, where he faced another one-and-one situation with 38.3 seconds remaining. Again, Steppe calmly sank both foul shots, pushing the lead to 60-56. "We work on free throws a lot in practice, so I felt confident," Steppe said. "I tried to stay calm. The first two, I was really nervous, but I felt really good on the next two." "We all had confidence in him," Angeles said. 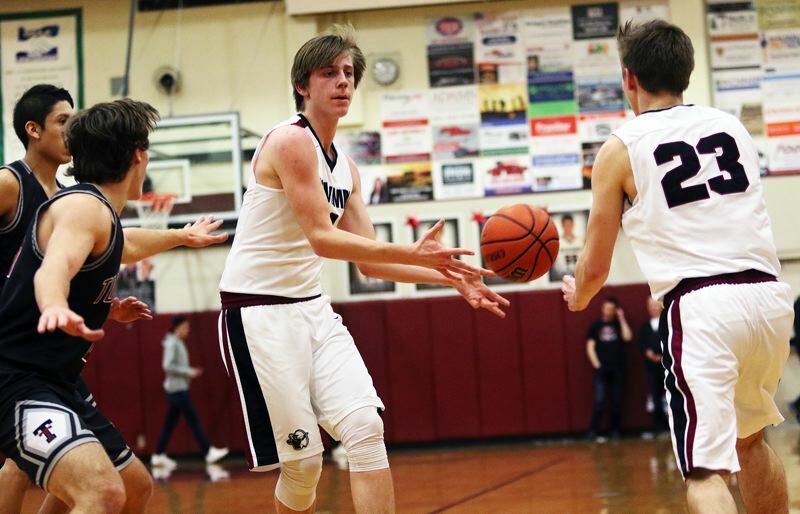 From there, free throws down the stretch by Angeles and Leneve helped Tualatin wrap up the dramatic 63-58 win. "It was a good team effort," Steppe said. "Everyone was ready to go." "We got some big defensive stops, and then we went out and ran," Angeles said. Angeles scored 10 of his game-high 21 points in the two overtime sessions. He also had five rebounds and a pair of steals. Platter added nine points for the Wolves. Miller, Leneve, Rose and Steppe each scored seven points, with Miller also having six rebounds. Senior Chris Freese also had six rebounds. 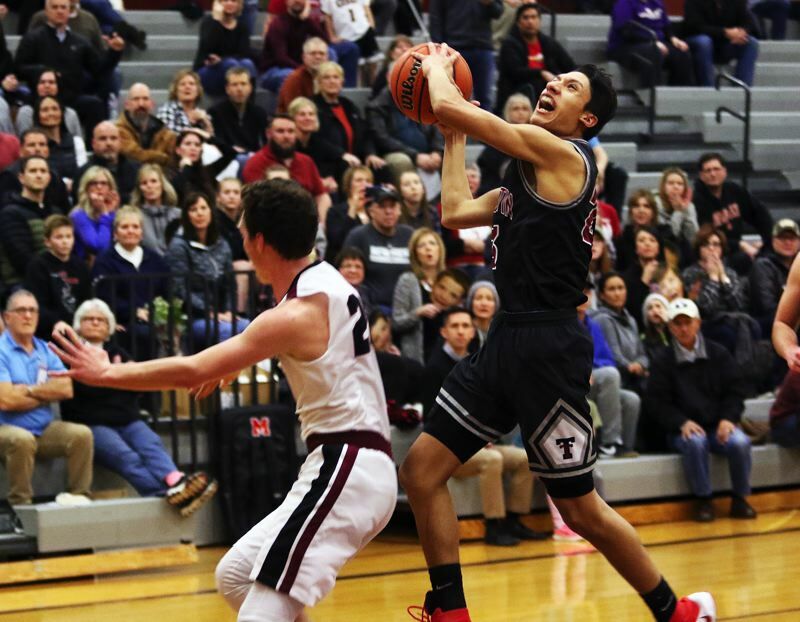 Tualatin, as a team, made 22 of 51 shots from the field, with five 3-pointers, and 14 of 20 free-throw attempts. Koronko led Sherwood with 17 points, going 5 for 8 from 3-point range. He also had a pair of steals. 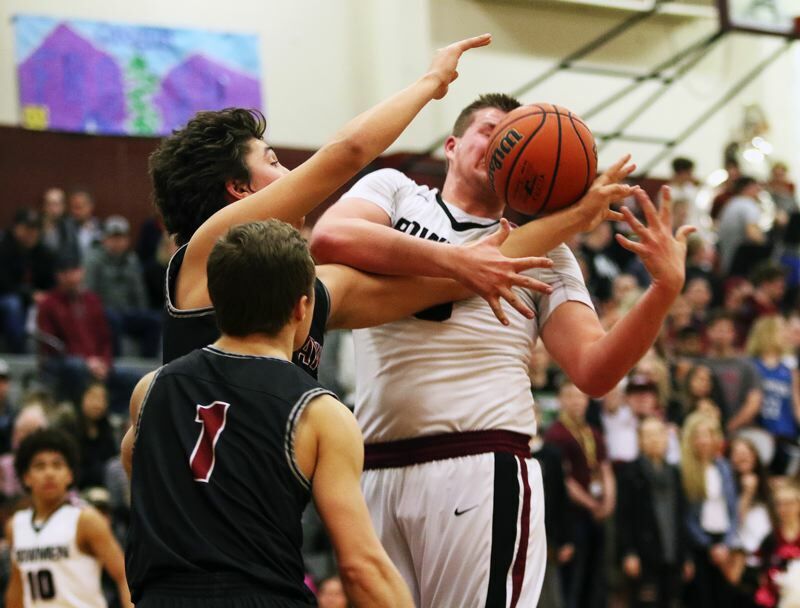 In addition to Hale's 13 points, the Bowmen also got eight points, eight rebounds, three steals and two blocked shots from Sucher. Grubbe scored six points. Bahns and Guerra each had five points. Sherwood, as a team, made 22 of 62 shots from the field, with eight 3-pointers, and six of 13 free-throw attempts. "We really wanted to win, but it was a really fun game," Hale said. "Games like this will help us." Both teams will open the Class 6A state playoffs on Wednesday. The Wolves will likely be at home, while Sherwood will be on the road.